I love the Steampunk look and I am totally savoring all the pages of the new book Steampunk: An Illustrated History of Fantastical Fiction, Fanciful Film and other Victorian Visions. If you are into Steampunk as well, click on this page from the book to enlarge and get an eye full of some great Steampunk costuming. Steampunk is the hottest science fiction counterculture, alive in fantasy novels, films, arts and crafts, fashion, comic books, music, computer games, even architecture. Enter a world of Victorian technology, where steam power meets space travel. From Jules Verne and H. G. Wells to Alan Moore, Hayao Miyazaki, and Philip Pullman, the genre has captured imaginations around the globe. Here’s the first grand, illustrated history of the counterculture movement in a book fittingly stylish in its design, package, and artwork. From the fastest dirigible and steam-powered ray guns to fashionistas Lady Gaga and Alexander McQueen, the whole story of the gaslight romance is here. James Blaylock is one of the originators of Steampunk science fiction. He is the author of The Narbondo Series, including The Digging Leviathan, Homunculus, Lord Kelvin’s Machine, The Adventures of Langdon St. Ives, The Ebb Tide, The Affair of the Chalk Cliffs, Zeuglodon, and The Aylesford Skull; The Balumnia Trilogy, including The Elfin Ship, The Disappearing Dwarf, The Stone Giant, and The Man in the Moon; The Christian Trilogy, including The Last Coin, The Paper Grail, and All the Bells on Earth; The Ghosts Trilogy, including Night Relics, Winter Tides, and The Rainy Season; plusThe Complete Twelve Hours of the Night, Land of Dreams, The Magic Spectacles, 13 Phantasms, On Pirates, The Devils in the Details, In for a Penny, The Knights of the Cornerstone, and The Shadow on the Doorstep. And some crafty links to inspire and delight! YOU MUST CLICK ON THIS LINK FOR THE MOST AMAZING SURPRISE!!!! I was simply blown away!!!! Trust me! Have you tried mail art? Mail art inspires creativity in both sender and recipient. Finding the right background fabric for an art quilt can sometimes be a challenge! Cherie talks about strength and art. One thing leads to another... how creating an art doll led June to creating a necklace. Tammy documents her training as a new recruit for Thirty-One Gifts, a company who sells bags and organizational products. Discover how easy it is to make personalized magnets using a photo and some fabric. If you love Steampunk and are looking for something to do in San Diego on May 11-13, 2012, why not check out the Gaslight Gathering? It's So-Cal's first dedicated Steampunk & Victoriana convention! Don't miss the Off Book/Typography/PBS Arts video. Even though she has very few drawing skills, Cyndi is pleased with the results of her latest quilt experiment. Learn how to applique a "Zzz" pillowcase. The spring ring: so easy to make and wear! Aileen shows you how she turned trash into treasure with a re-purposed whisk, ribbon spool, felt and a little ingenuity. You know when you buy bits of this and that and you don't know what you're going to make with it but you know you just have to have it? Such is the case with this cool little vintage style gun embossed metal finding. So off to the book Steampunk Style Jewelry for some inspiration because I just wanted to wear it somehow! I loved the combo of the hardware and lace in the Minerva's cuff project by Annie Singer featured in Steampunk Style Jewelry. I wasn't using the same elements at all but the inspiration was there. Making these types of recycled leather cuffs is really easy! The first thing I needed to do was bend the flat metal finding into a curve. I went out to the tool box and had a look around. I picked up my rubber mallet and used the handle of my 3 pound sledge hammer as a mandrill. I simply kept hammering it a bit then trying it on my wrist till it fit. Then I cut a piece of scrap leather to fit on my wrist with the width of the Velcro as the amount of the overlap. I wanted to incorporate another detail, so off to the trim stash! I found this part-lace, part-hook trim that I thought looked pretty cool. I stitched all the trim and Velcro on using the sewing machine with a leather needle. Then I hand-stitched the metal finding on. The last bit I added was the two studs. One of the prongs of the stud went through the hole of the metal finding and the other three just went through the leather cuff. This hid the hand stitches. This how-to jewelry-making book features the work of an array of invited jewelry designers influenced by the growing Steampunk trend. In Steampunk Style Jewelry, the projects focus on "no fire" techniques—like simple stringing, wirework, hammering, stamping, gluing, stitching, and off-loom beadwork—so that even a beginner can create pieces in the style. Each project provides a complete materials and tools list, step-by-step instructions, and clear illustrations. Jean Campbell was the founding editor of Interweave’s Beadwork magazine and has written and edited more than 40 books. She has appeared on the DIY Jewelry Making show, The Shay Pendray Show, and PBS' Beads, Baubles, and Jewels. She also teaches beading workshops throughout the United States. Swarovski has named Jean as one of their Certified Brand Ambassadors for the line of crystal beads and stones for beadworkers and crafters. What is your favorite Steampunk element, object or thing to draw or design? Answer this question in today's comments by Midnight ET November 2, 2011 and you could be the proud new owner of a free copy of the new book How to Draw Steampunk: Discover the secrets to drawing, painting, and illustrating the curious world of science fiction in the Victorian Age. This fun page from How to Draw Steampunk explores the interesting concept of how shape and body proportions can help define a character. And this page features one step of the tutorial featured in How to Draw Steampunk on how to draw a lightning gun and a Steampunk weapon from the movie Cleric. Joey Marsocci and his wife, Allison DeBlasio, are the proprietors of Dr. Grymm Laboratories, a business that provides custom designs of steampunk props and creatures for film production companies across the United States. Joey’s contraptions and sculptures have been seen in steampunk exhibits and publications around the world. Joey has a BFA in Film and Animation from the California Institute of the Arts. Bob Berry has been an artist, illustrator, and character and graphic designer for more than 15 years. While the mainstay of Bob Berry’s work is for children’s publishing and textbooks, Bob has also provided art and illustration for CDs, children’s games, toy packaging, and more. Visit bobberryillustration.com. Happy Monday! I hope you all had a great weekend. First up: a big congrats goes out to Dr. Grymm, author of 1,000 Steampunk Creations: Neo-Victorian Fashion, Gear, and Art, on his inclusion in a very cool New York Times article - Steampunk At a Glance. Drew reviews the Knook - a kit that teaches you how to knit with a crochet hook! See bling I designed inspired by Margot Potter's latest book New Dimensions in Bead and Wire Jewelry and win a copy for yourself! Continuing with her clothing obsession, Cyndi has taken out her acrylics to use on a summer dress! Look at this cute coffee can recycling project. 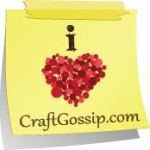 It also uses craft stash scraps, so it’s both economical and ecological! Tammy has some important news about a very popular knitting loom. Carmi has a Crafter Companion paper fairy idea to show off this week! This week Aileen offers you a re-post of her Chunky Canvas Bird Cage Tutorial. Now is the perfect time to get a jump start on your holiday crafting, and Sherri will help you get a jump start on making your holiday gifts.